Hi everyone, I’m back today with another fun Tip Tuesday for you all. I remember when we first started homeschooling. I had visions of kids cuddling up and reading quietly on the couch during the afternoons. It was just one of the many preconceived notions that I had about homeschooling. But just like all of my other stereotypes, my envisioned reading scenario wasn’t playing out in our home. Now that’s not always a bad thing, because I’ve learned over the years that each homeschool looks different. And that’s okay, flexibility is what homeschooling is all about! However I do want to teach my kids to enjoy reading. I want them to read for both fun, and to learn about things that are interesting to them. Over the past several years we’ve tried all kinds of structured reading programs. And today I want to share what I’ve learned over the course of our homeschooling years, and how we’ve moved out of the structured reading curriculum box and into a whole new world of learning! 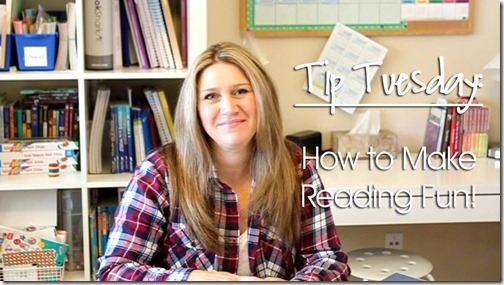 Find out how in today’s Tip Tuesday: How to Make Reading Fun! I hope you found today’s video helpful. And remember, whether you’re a home full of readers, or one struggling to get your kids interested in reading, it’s okay! Each homeschool is different. So make sure to do what works best for your family. 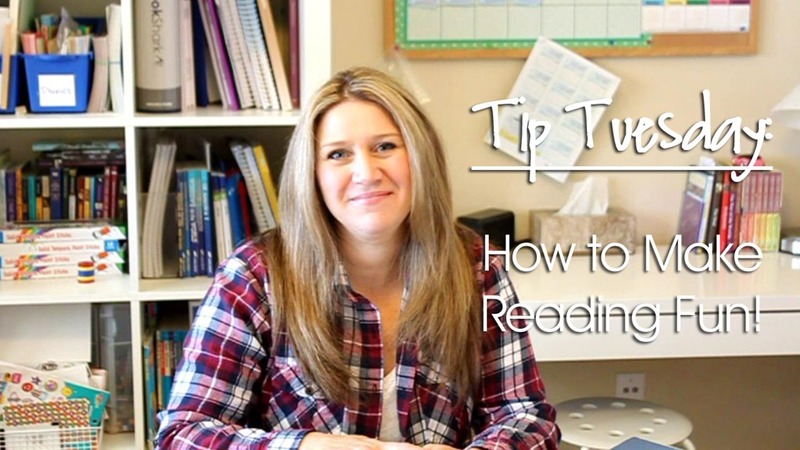 And don’t forget to check out my Reading Incentives post to help motivate your students! Great video! Any suggestions on books that your son has really liked? Some of his faves are the Gregor the Underland Chronicles, Percy Jackson series, and the Kingdom Series by Chuck Black. Erica, my nine year old son is LOVING the Percy Jackson series. 🙂 His other favorite is Guardians of Ga’Hoole series. Oh, we haven’t read the Guardians series, I’ll have to check that out thanks! Afternoon Erica ~ Thank you for posting this video. Even though our little ones are younger, I just ordered the first in the Kingdom Series by Chuck Black. By chance, can you recommend any books for boys in the first or second grade reading level. Again, thank you for this post, video, and replies above. Mr. Putter and Tabby books are awesome for 2nd grader level readers! Hi Evelyn, I would take a look at any of the books in my Classic Literature Vol. 2 pack. They’re geared towards younger boys! Have you ever tried the “Ready, Freddy” chapter books by Abby Klein? My boys have really enjoyed that series. In the first several books the main character is in first grade and in some of the newer ones she writes about his experiences in second grade. They aren’t super-deep classic literature or anything, but they are cute, fun stories for that age of boys to read. Loved the video! We are still in the learning to read phase and it is going pretty slow. We are about half way through AAR Level 2, but my son still struggles a lot. Any tips for this stage or favorite beginning readers that he might enjoy? Hi Erica ~ This is the same level I was asking about in my reply above. Thank you again for any reading suggestions (books) for boys this age. Have a blessed day! I think I would suggest you reading with him. Have him read a page, then you read a page, and so on. Alternating will help give him a break, but also work his skills at the same time. And if he’s anything like my kids, they like reading with me. I would also head to the library and find books that interest him. They don’t have to be fictional readers, but maybe something non-fiction that he’s into like animals, etc. Also the books in my Classic lit vol. 2 pack are kind of geared towards boys, so you might want to check those out. The classic start books are abridged versions of the classics so they’re much easier to read for younger readers. Thank you for your Tip Tuesday videos! I look forward to them! Hi Erica. This is how we do our reading as well. My question is, what do you do when they get halfway through a book and they lose interest?Would you make them finish it or allow them to choose another one?